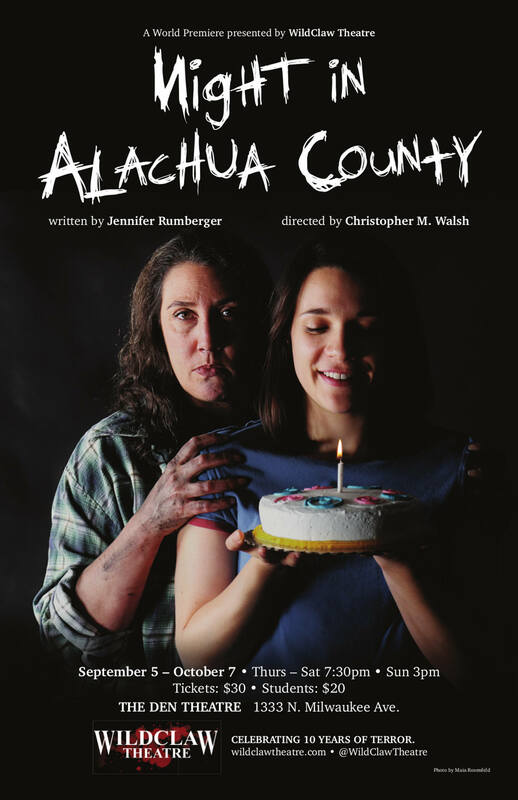 This week we started rehearsals on my latest directing project: NIGHT IN ALACHUA COUNTY, with WildClaw Theatre. It’s about a woman who returns to her hometown after 17 years to face the mother and sister she left behind, along with the disturbing secrets they share. Also, there is some necromancy and an eyeless demon creature. Last night, I put the cast through their paces with a 4-hour violence rehearsal, which in hindsight may have been a little mean. We got a ton of work done, though. Our poster artwork was made public today, and it looks friggin’ fantastic. Previews begin September 5th. We open September 8th and run through October 7th at the Den Theatre on Milwaukee Ave.